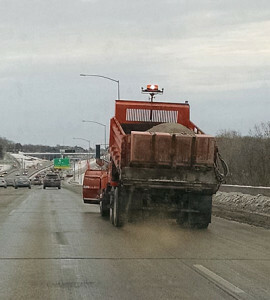 DOT truck treating the interstate. There are some slick roads and sidewalks across the state due to freezing rain this morning. Many schools in eastern Iowa canceled or delayed the start of classes. Robert Fangmann, the Cedar County Engineer in Tipton, said roads that were cleared earlier are turning icy again. A freezing rain advisory was posted earlier this morning for a few counties in western Iowa, including Harrison County, where Tom Robbins is the road maintenance foreman. “It’s slick. That mist hit at just the wrong time with the wrong temperature,” Robbins said. Some blowing snow is possible today over northern Iowa. Temperatures are expected to fall throughout the day with brisk northwest winds tonight. Low temperatures tonight will be in the single digits and low teens, but the wind chill will make it feel below zero. A Winter Weather Advisory is in effect for much of north central and eastern Iowa through midnight. The forecast calls for highs between 10 and 20 tomorrow. A warmup is expected for the weekend with highs on Friday and Saturday between 35 and 50.